Superman sure does have a lot of superpowers, doesn’t he? He can fly higher than Boeing 747. He can lift an entire skyscraper with his bare hands. He can even use his heat vision to cook some pizza rolls when he wants a snack. Yes, he has no shortage of cool abilities and any kid would give away his weekly allowance just to have a taste of that kind of power! Unfortunately, unless your kid came to Earth inside of a rocket ship that came straight from Krypton, chances are pretty good that your child doesn’t have any superpowers. The good news is that through the power of costumes, your child can be anything with a little bit of imagination. Even Superman! When your child wears this deluxe Superman costume, he’ll feel every bit as heroic as the character from the Justice League movie. The costume comes with a full jumpsuit, designed to look like the one worn by Henry Cavill in the DC movies. It has faux muscles designed into the chest along with the S-Shield symbol. The costume also comes with a red cape. Just suit your child up in it and even Lex Luthor will be thinking twice about causing trouble in your home! 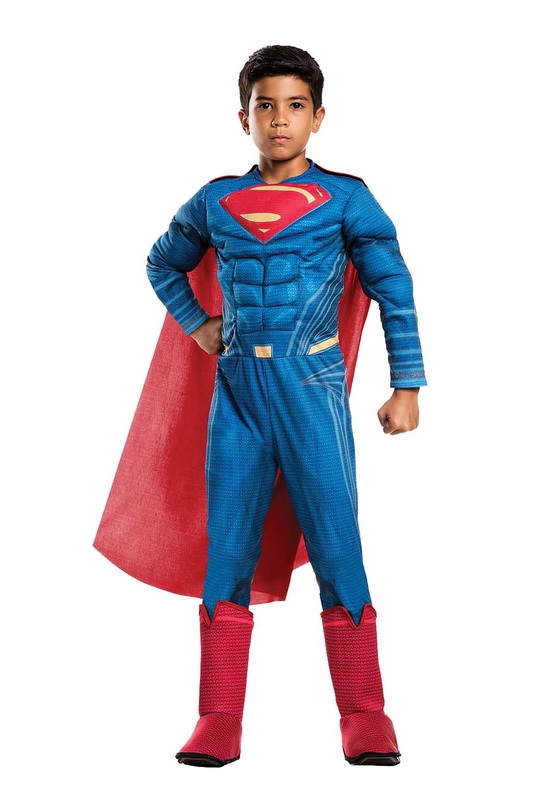 Just remember that his costume doesn’t actually give your little one superpowers, so you may not want to send him into a battle against super villains by himself! Make sure to check out all of our Justice League costumes to get a full team going to give your child some backup against those baddies.